This new 1.3 mm VLBI detection confirms that short-wavelength VLBI of Sgr A* can and will be used to directly probe the event horizon of this black hole candidate: in short, Sgr A* is the right object, VLBI is the right technique, and this decade is the right time. Last edited by newolder on Feb 18, 2017 11:51 am, edited 1 time in total. I can't find a link, but I'm pretty sure an image of this kind was made years ago, although it wasn't of Sagittarius A*, but of a more local, stellar black hole. EDIT: On the other hand, it might have been only a simulation. The campaign to capture the first-ever image of a black hole has begun. From today (April 5) through April 14, astronomers will use a system of radio telescopes around the world to peer at the gigantic black hole at the center of the Milky Way, a behemoth called Sagittarius A* (Sgr A*) that's 4 million times more massive than the sun. Though the current observing campaign will be over soon, it will take a while for astronomers to piece together the images. For starters, so much information will be collected by the participating telescopes around the world that it will be physically flown, rather than transmitted, to the central processing facility at the Massachusetts Institute of Technology's Haystack Observatory. Then, the data will have to be calibrated to account for different weather, atmospheric and other conditions at the various sites. The first results from the campaign will likely be published next year, EHT team members said. Katie Bouman's related TED talk. Oranges, Mick Jagger, discoball, giant elephant and puzzle :) Very cool. The space.com silmulation is obviously based on the assumption that Saggitarius A* is not feeding on any gas. However, AFAIK, it started doing just that a year or so ago, so it will not look quite as shown in the picture, I suspect. Update on the data analysis: Why Don’t We Have a Photo of a Black Hole Yet? Observer1 - "Oh no, the AI units have spotted one of the major glitches in the program"
Observer2 - "Oh well, shut it down then and boot the next universe simulation, what are we up to now, 43?" ESO Media advisory about the EHT analysis: https://www.eso.org/public/announcements/ann19018/ - not an April Fool's prank, btw. Black hole shadow sizes were predicted to be about 50 microarseconds for #SgrA, 20-40 #M87 depending on mass, and smaller for other black holes. The resolution of the #EHT is at best 20 microarseconds with incomplete coverage. So, don’t expect anything like @Interstellar #Movie. 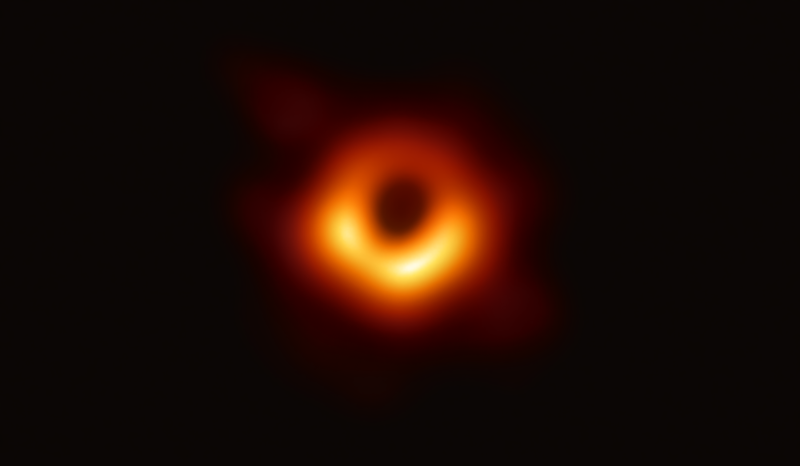 A global network of telescopes has been working to capture the first ever image of a black hole. On April 10 at 9 a.m. EDT, the National Science Foundation will hold a press conference to announce a groundbreaking result. What are the implications of our finding? Plenty, and here I offer one that is far-reaching. The orientation of G359.944-0.052 now clearly tells us about the orientation of the jet axis, which, interestingly, coincides with the rotation axis of the Galactic disk. As the jet axis most likely follows the SMBH's spin axis, we may infer that the angular momentum of the SMBH has been coupled to that of the entire Galaxy, perhaps over a long time comparable to the age of the Universe. It would be very interesting to figure out the exact means of this coupling. But above all we are eager to see whether future observations, such as those afforded by the Event Horizon Telescope, may verify (or disprove) our jet proposal. ETA - The EHT has two supermassive black holes in its sights - the one in M87 is a thousand times further away than Sgr A* but is about 1000 larger. It may be M87 that grabs the headlines, who knows? Last edited by newolder on Apr 09, 2019 7:18 pm, edited 1 time in total. It'll be Cthulhu or nothing. aufbahrung wrote: It'll be Cthulhu or nothing. OMG THEY’RE MESSING WITH THE DATA!! FAKE NEWS!! !